DTechy ANDROID NEWS MICROMAX A110Q CANVAS 2 PLUS 5INCH QUAD CORE LAUNCHED AT PRICE OF RS 11999 . Micromax , a leading mobile manufaturer has launched Micromax A110Q Canvas 2 Plus . 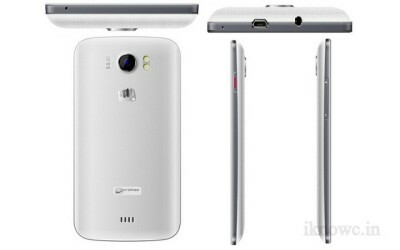 Micromax A110Q Canvas 2 plus is the improved version of MICROMAX A110 Canvas 2 . The company is already selling huge amount of Canvas devices on monthly bases . Micromax was first one to launch budget low cost android device . Micromax A110Q is priced at Rs-11999 . Micromax A11oQ Canvas 2 Plus is successor to Micromax A110 Canvas 2 . The company has already launched several Quad core devices this year but no handsets yet with 2GB RAM . Xolo Q1000 , Celkon A119Q , Zen Ultrafone 701HD , Canvas HD .. can compete with this handset . The device is priced at RS 11999 . Micromax A110Q canvas 2 plus draws its strength from 1.2GHZ quad core processor and PowerVR SGX 544MP2 GPU . The device runs on android 4.1.2 jelly bean as os . The user can insert two SIM cards ( mini SIM ) . It has 5inch IPS capacitive touch screen having resolution of 480 X 854 Pixels and having around 196 ppi ( pixels per inch ) . The device has 1GB RAM and 4GB ROM (internal memory ) of which 1.5GB is available for user . The A110Q Canvas 2 plus has 8MP AF ( auto focus ) rear camera with dual LED flash and 2MP front facing camera . Micromax has included features like Geo-tagging , touch focus and face detection to make camera of the device more approachable . There is 2000mAH battery to power Micromax Canvas 2 Plus which claims talktime upto 6 hours and standby time of 280 hours . The A110Q has 2G , 3G , wi-fi 802.11 b/g/n ,GPS with A-GPS , micro USB , Bluetooth and 3.5mm audio jack . 5inch FWVGA resolution screen . 2G , 3G , wi-fi 802.11 b/g/n ,GPS with A-GPS , micro USB , Bluetooth and 3.5mm audio jack . 8MP REAR CAMERA & 2MP front camera . 1080p video play back . Buy Micromax A110q canvas 2 Plus from Micromax Online store .